Label resident Vitodito comes along with arguably his best work up to date, a beautiful mixture of progressive and uplifting vibes combined with angelic vocal chops and a fat bassline. The result is, 'Napoli'. The talented Italian makes clear to us all that he is to be on everyone's lips for the coming months and will continue delivering quality to the Harmonic Breeze stable. For this release, we have quite a package. On remix duties we hired Sunn Jellie, Suncatcher and last but not least, Domenico Cascarino & Luca Lombardi. 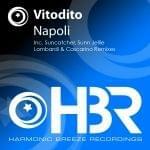 Artem Kleptsov better known as the Sunn Jellie has been one of our favorite producers in the progressive scene for a while now and after following his work closely during the past months, we have decided to get him on duties for 'Napoli' which has lead into a very groovy, warm and stellar progressive house remix. On the other hand, Suntcatcher no longer is in need of an introduction, we are pleased to have him on board, doing what he does best. The Romanian talent took things to the next level with his fantastic uplifting remix! Our listeners know our passion for chillout music and that we try to provide chillout remixes rather often. Well, get ready for this treat! We asked arguably one of the best upcoming chillout acts out there to transform this track into a blissful easy-listening wonder which really has gone beyond our expectations. Expect more from the Italian due Domenico Cascarino & Luca Lombardi to come on our imprint. Something for all tastes, in one release.